Just outside the town of Zillah, WA, is a unique little gas station, shaped like a Teapot. It is a personal monument to the Teapot Dome scandal during the Harding administration in 1921, built by the proprietor of the gas station, Jack Ainsworth. I’d like our winery to be looked at the same way, years into the future. I’d like it if someday people wonder why we chose a prehistoric lake to name our winery after – and that the corruption of science that has been the global warming scandal is a distant memory, like Teapot Dome is today. Our company is coming out of the closet. We are confessing our heresy. We don’t believe in human-caused “Global Warming” and are admitting that it was our intention all along to name our winery after Glacial Lake Missoula, to increase popular knowledge in the earth’s real climactic history. We started the winery in 2002, and we believed that the truth would eventually come out, as the evidence against Anthropogenic Global Warming , even then, was over-whelming. In 2006 we released our first wine, our 2002 vintage onto the market, and one month later, An Inconvenient Truth was released to much media fanfare. 2007 was not only the year that Arctic Sea-Ice Extent was at its recent historic minimum, but also the high-water mark for global warming hysteria. Green marketing became ubiquitous and verged on the nonsensical. In November 2009 the “Climategate” e-mails surfaced, just prior to the doomed Copenhagen IPCC conference. Just as some corporations feel it is their responsibility to legitimize the junk science of Global Warming, we see it as our corporate social responsibility to inform others of the global warming hoax. We are also alarmed and offended by the demonization of Carbon Dioxide, a gas that makes all life on earth possible. We refuse to refer to the benevolent CO2 gas that resides and percolates through our wine as a pollutant or a toxin. The fact is that CO2 is entirely beneficial, in making all plants more productive and more drought resistant. CO2 is not called by scientists “the Gas of Life” for nothing. We are also not called “Carbon-based lifeforms” for nothing. If you look at the graph to the left, you see that CO2 has been diminishing in our atmosphere over the last 600 Million years, as carbon life-forms (mostly plankton) became sequestered in limestone, and oil and gas deposits. Human beings burning fossil-fuels are giving back CO2 to the atmosphere that once resided there, and that once supported massive explosions in life. (Cambrian and Triassic periods.) Isn't this a good thing? If minimizing our collective carbon footprint is to be the paramount consideration in all things – why should we be in business at all? Does the world need another boutique winery? Rather than symbolic gestures like using recycled paper on our wine labels, why go into business at all? The existing larger companies could simply increase their production to meet any rising demand, more efficiently than we could. For that matter, a Soviet style wine monopoly could churn out vast quantities of low-cost wine, (with a much smaller carbon footprint) more efficiently than the hundreds of Washington wineries dotted across the state. Rather, I believe that our individual carbon footprint is nothing less than the quantification of our individual “Pursuit of Happiness”. CO2 is making the worlds greener, increasing all vegetation (including crops and phytoplankton), and stopping desertification. Of all the people on earth, winemakers, should be capable of understanding the relationship between C02 and the earth's changing climate. Winemakers (and beermakers) must understand the power of dissolved CO2 and its relationship to temperature to safely do their jobs. Cold water (or aqueous solutions like wine must or beer wort) can dissolve enormous amounts of CO2. Winemakers also know that as an aqueous solution warms, it out-gasses any dissolved CO2. Everyone knows that an open carbonated beverage left at room temperature will go flat, but that if it kept cold, even an open bottle of champagne will keep its fizz much longer. According to these Antarctic ice cores, the connection is crystal clear, temperature and CO2 are in complete correlation. The deception in An Inconvenient Truth is that temperature change precedes the CO2 change by 800 years. In other words - CO2 lags temperature by approximately 800 years. A cause precedes its effect. Therefore, temperature change caused the change in CO2 levels, not the other way around. The peaks of the spikes on the graph are separated by 800 years, that is why the large timescale of 600,000 years is chosen by Gore, and why the two graphs don't overlap. So, from the Vostok ice cores, we see that when the earth warms, CO2 is outgassed from the oceans, and when the earth cools, more CO2 is dissolved into the oceans. The lag happens because it takes more time for the oceans (water is denser than air, the oceans have complex circulation) to give off the heat acquired during the warming periods. Additionally, oceans probably have other sources of heat (hydrothermal vents, submarine vulcanism) that add heat (and CO2) that mitigate temperature loss in the short term. Another thing that should make a winemaker scratch his head is that if CO2 has this amazingly powerful property of Radiative forcing, of being able to amplify heat, why is this not factored into heat-load calculations of fermenting wine musts? To calculate how much refrigerative power their cooling systems require, winemakers rely on formulas about how much heat is generated from the conversion of sugar into alcohol and CO2, during fermentation. But these formulas do not factor in radiative forcing, and never have. How can a closed 10,000 gallon tank of fermenting wine must, with billions of tiny reactions happening every second, producing heat and CO2 in every cubic inch, in a liquid super-saturated with CO2 - how can radiative forcing not be a huge factor? If it were, then every winery refrigeration system would be inadequate, because it doesn't factor this in. The answer is quite possibly what the IPCC itself says in its latest Report, that perhaps the Radiative forcing property of CO2 has been overestimated. There are many intersections between the Global Warming and the world of wine. Historically, cultivated grapes have followed human civilization as it followed warming temperatures. The" Roman Warming" is a climactic period from about 250 BC until 400 AD, where temperatures were warmer than today, and the same period saw the expansion of the Roman Empire into Gaul and Britannia and the vineyards that followed with them. With every warming period in human history, wine-grapes have been transplanted and moved from the near east to Europe, and then throughout Europe. Humans are always trying to grow grapes in locations that push the envelope. The fact is that grapes need a certain amount of heat to function, and for grapes to ripen. If our climate cools over the next few decades we will see significant shrinkage of our more marginal wine regions. Sunspots (one measure of solar activity) over the last forty years. Why the 1980's, 1990's and early 2000's were full of good wine vintages, and why it could be last call for great vintages...Solar Cycle 25 is predicted to be even smaller than our current cycle 24. I've learned a great deal about the earth sciences, having been challenged by the Global Warming / Climate Change propaganda campaign that has, despite all its blatantly obvious flaws, gained a huge degree of legitimacy in our society. It is taught in schools, universities, and most industries (even oil companies) have swallowed the narrative hook, line and sinker. Taken together, it represents a huge misallocation of rescources (trillions of dollars!) from real problems to a fake one. Like I say, I've enjoyed learning about the earth's real climactic history, how it is expressed in the earth's geology, how it affected the evolution of life, and how it even affected human civilization. It is amazing how it all is interconnected, and how deep our collective scientific understanding of the earth and its history is. I encourage you to learn more about it. The Global Warming narrative does not connect well with what we have learned in the other sciences - it is inconsistent with much of it. This is the first a priori problem with AGW (Athroprogenic Global Warming henceforth as AGW) as a scientific theory: Parsimony. AGW is not parsimonious with most of geology, and climactic history. The Medieval Warm Period, erased from history by Michael Mann's infamous "hockey stick" graph, is extremely well documented. The debunked "Hockey Stick" graph by Michael Mann, conceived to erase the Medieval Warm Period from the history books. The proof of the abundance of wealth that flowed from our largely agrarian economy, during this 400 year period of sunny climate, is in the profusion of cathedrals built in Europe during this time, the re-flowering of knowledge and even in the crusades. People had such an abundance of food, that gave them the free time and thus the luxury of producing the cathedrals, and even engaging in wars of adventure. During this time, Eric the Red colonized Greenland and even sailed to Newfoundland. Indigenous peoples also colonized Greenland, coming by way of Siberia, in the mostly ice-free Arctic ocean. In the same period, in Meso-america, the classic Mayan empire came to screeching halt - because of unfavorable changes to weather patterns. Proof of the warmer climate in the Medieval Warm Period has also been thoroughly documented in sediments, stalactites and even tree-rings around the world. A theory should be consistent with (parsimonious) existing theories unless it is truly revolutionary (like Bretz's Spokane Floods.) Global Warming is not consistent with the existing body of recorded history and temperature reconstructions of the past. There have been huge climactic swings that punctuate the rise and fall of civilisations in our recorded history. Scientists are not priests in some religion. The are not oracles. They have no more legitimacy to make predictions about the future than televangelists do. The only legitimate function for prediction in the scientific method, is to test or corroborate a theory. This was done to test predictions that follow from Einstein's theory. This is done to verify and falsify all sound scientific theories. The IPCC correctly calls the future scenarios it creates as "projections", and is careful to say that they are not predictions, which they acknowledge is outside the scope of science. These projections are the predictive test of their theory, however, and time will show just how right or wrong their theory (their models) are. The zeal with which proponents of AGW pursue their cause belies their theory's illegitimacy. Albert Einstein did not need to slander those who were skeptical of his theory - he didn't need to demonize them or call them Deniers. Because his theories made testable predictions, he waited until those skeptics were won over by the facts. He also famously joked about a petition by dozens of Nazi scientists who condemned his theories, that it only took one person - with one fact to overturn his work! His point was that consensus has no place in science. In the brief YouTube lecture below, by physicist Sallie Baliunas, she states how authorities in the seventeenth century, (during the Little Ice Age), after a particularly horrible hail-storm that destroyed crops across much of Europe - believed that because they had not seen such an extreme event like that in over one hundred years, it could not have been natural. Those responsible were witches, using supernatural powers to "weather cook" and bring calamity. The alleged witches were rounded-up, prosecuted and executed not by mobs, but were directed by the same wise, well intentioned leaders (mayors, government authorities) who sought to do something - anything to make sure this never would happen again. Those who defended the accused's innocence (Deniers), often met the same fate. Likewise, today many of our politicians and environmentalists find climate criminals - the oil companies, and most importantly anyone who expresses skepticism of AGW - as responsible for each and every extreme weather event. As if hurricanes, typhoons, tornadoes, droughts and floods have only recently appeared in our now despoiled Eden. Note that AGW still is not accepted by the great majority of Americans, and that like the witch-hunts, its promotion is driven by powerful elites, many of whom, like Al Gore, just happen to profit enormously from it. I remember from taking Philosophy 343, Philosophy of Science, at SFU, the argument that Models should never be interpreted as evidence. Models are tools to hone and perfect a hypothesis - but one still requires evidence from the real world to confirm your hypothesis. The world is not looking like the models. With each passing year, the doomsday rise in temperature will look more and more out of sync with reality. Watts Up with That (WUWT) is an outstanding source of news and information about the latest in climate science. Scientists and layman from around the world meet to discuss serious issues, from Climate Modelling, Solar physics, sub-oceanic volcanism, to Svensmark’s Cosmic Ray theories, to humorous explorations of our culture’s reading of climate science. The website also has amazing reference pages that have the latest data on Global Temperature, Sea Ice, Solar, even the weather. It was started by Anthony Watts, a former TV Weatherman in Chico, CA., who noticed that weather stations across the country were now situated in sites that were in no longer suitable for accurate measurement of U.S. surface temperatures. Urban expansion had surrounded once rural surface weather stations and allowed the very real urban heat island effect to skew temperatures upward. Watts started surfacestations.org a crowd sourcing experiment to document all of the 1221 weather stations. Over the years with 85% of the stations documented they found that 82% of surface stations failed NOAA’s own standards. 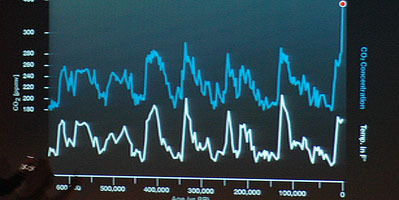 The author Michael Chrichton elegantly illustrated the same point in his 2004 novel State of Fear by showing multi-decade weather station graphs from urban centers like New York City or Berlin, and their clear upward temperature trendline, compared with weather stations in rural areas just outside their respective cities, with a flat trendline. The fact that these essential tools were being allowed to deteriorate, and that their biased readings happened to fit the alarmist narrative, spurred Watts to publish his results in a peer-reviewed paper in the JOURNAL OF GEOPHYSICAL RESEARCH, VOL. 116. Skip all the way to 11:20 and you will hear the brilliant Camille Paglia give her concise opinion on Global Warming! Greenpeace co-founder Dr. Patrick Moore brings us his thoughts on the subject of Climate Change. July 8, 2014. Engineer and aviation pioneer Burt Rutan gives his presentation on why he doesn't think global warming/climate change is a problem. Dr. Sallie Baliunas giving a brief and very interesting lecture on the role of extreme weather on the witch-hunts of 17th century Europe - an obsession that has very real parallels today. Illustrating that at the root of this "science-based" nonsense is the crudest of superstitions - that people (climate criminals) can effect the weather. "No Pressure" A charming, short film that illustrates how open minded and caring proponents of Global Warming are. Produced by Bill McKibben's organization, 350.org. An short amusing video that puts our present temperatures into perspective. Our propaganda - a CGI virtual fly-through of the massive ice-age lake, that flooded the Pacific Northwest over 80 times. Tony Heller looks at the long, comedic, and very dangerous history of academic alarmism. Feeman Dyson, the greatest living scientist, talking about criticism of his contrarian view about Climate Change. Ivar Giaever, Nobel laureate (Superconductivity) is a brilliant scientist and presents a very persuasive case against AGW. Professor Emeritus of Geology, Western Washington University, Bellingham, WA - Don Easterbrook, Ph.D.
Michael Crichton was another great mind to reject AGW.